The walls awere adorned by James Addison from Hornby, Lancashire, about 1680; designs were partly repainted and perhaps damaged by William Mackreth, Hawkshead, 1711-12; whitewashed over 1790s; discover, then repainted by William Bolton, Hawkshead, 1876; restored under the supervision of Janet Lenton, 1955. Photograph, black and white, St Michael's Church, Hawkshead, Lancashire, by Herbert Bell, photographer, Ambleside, Westmorland, 1890s. Photograph, sepia, St Michael's Church, nave, Hawkshead, Lancashire, by Herbert Bell, photographer, Ambleside, Westmorland, 1890s. Probably dates from late 15th early 16th century, improved in the time of Elizabeth I.; various improvements, especially 1700s-20s; etc. Church. Late C15 or early C16, north aisle rebuilt 1578, clerestory c.1578, vestry and hearse house c.1793. Stone rubble with slate roof. Single vessel nave and chancel; aisles and chapels under lean-to roofs; west tower and north-west vestry. Tower has west pointed entrance, 2-light single-chamfered- mullioned window above, and straight-headed louvred bell opening; top cornice and embattled parapet with angle pinnacles rebuilt 1875. To south a small window with clock face above, below bell opening. Vestry under lean-to roof to north of tower has 3-light mullioned windows, the mullions rounded, the lights elliptical-headed; segmental-pointed entrance to hearse house below. North aisle has similar windows of 3 lights with label moulds, western bay has entrance with elliptical-head; jambs roll moulded and arch rusticated; gabled porch of 1933. North chapel has east window of 3 lights and 5-light north window similar to those in aisle; western entrance has canted head, roll-mould and flanking hollows and Sandys arms over, with initials: IS, and date: 1578, label mould and small canopy. North clerestory has 4 windows of 3 lights with wooden mullions. Chancel has window of 1893, of 5 lights with Perpendicular tracery. 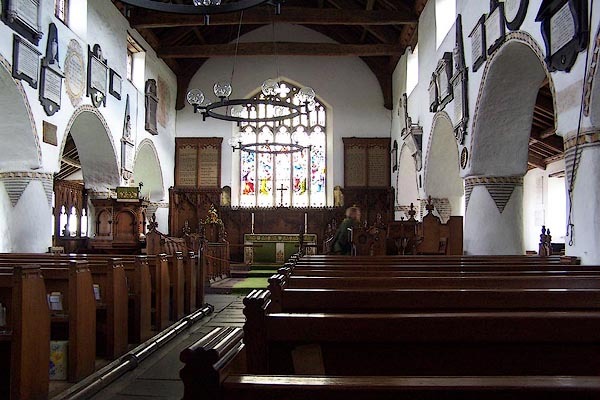 South aisle has 3 straight-headed windows with cusped lights and hollow-chamfered mullions, the 1st of 3 lights with label, the 2nd of 2 lights, the 3rd of 3 lights, the 1st and 3rd probably of 1875. Chapel has pointed entrance, now window and 2-light window with label mould; east 3-light hollow-chamfered mullioned window. Part of cusped window head to left of former entrance. Clerestory has 4 windows of 3 segmental-headed lights. Datestone (possibly renewed) has date 1633 under cable mould (probably date of south windows). Interior has 5-bay arcades, simple segmental arches on round piers, no capitals or bases, all heavily plastered, with whitewash and painted decoration to extradoses and pier heads by J.S. Addison c.1680. Piers to south slightly square. Roof has tie beam and collar trusses; aisles have chamfered principal rafters and purlins, those to north chapel with mouldings. Nave and aisles, have wall paintings: texts in ornamental surrounds; by J. Addison c.1680; some possibly restored by W. Mackreth, 1711, also list of church wardens for that year on intrados in north arcade. Paintings to outer aisle walls and 2 in nave repainted by W. Bolton, 1876, also that to west wall. Wall monuments to nave clerestories. West wall has 2 Rawlinson monuments from church of St Dionis Backchurch, London. Daniel, died 1679 and Sir Thomas, died 1706, both elaborate, with columns, entablatures, cherubs and cartouches. In north chapel a chest tomb, William and Margaret Sandys, with recumbent effigies, dated 1578. Screens to north chapel, east wall panelling, stalls, pulpit, font, 1875. Late C19 stained glass to east and south. Print, uncoloured engraving, Hawkshead Church, ie St Michael's Church, Lancashire, published 1870. On p.78 of Furness, Past and Present. which he did in 1680. 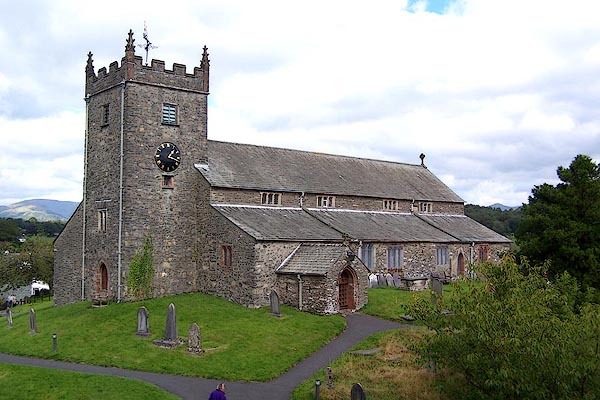 William Mackerath, Hawkshead, repained some in 1711-12, added the list of churchwardens, and a new sentance near the pulpit which has the dialect t' for the. All were whitewashed over in 1794, but revelaed again in 1875. A statute 18 Charles II c.4, 1666-67, and a more strictly enforced statute 30 Charles II c.3, 1778-79, were passed to encourage the wool trade by ordering that burial should be in wool. An affidavit was made at each burial that the law had been complied with; a penalty of 5 was imposed on the estate of the deceased and anyone connected with the burial. The acts were repealed by George II, 1814, though it had long been disregarded. There are more than 200 of the old affidavits in the church safe, dated up to about 1696.